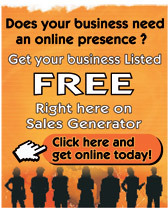 By accessing or using Salesgenerator.com.au services, including the Salesgenerator listings and advertisements you agree to the use and disclosure of your personal information in the manner described in this policy. Salesgenerator.com.au is bound by the Privacy Act (1988). The public as you advertise and list your services with Salesgenerator OR use publicly available "communication services". if I don't want to provide personal information? Salesgenerator may use "cookies". A cookie is a small file that stays on your computer until, depending on weather it is sessional or a persistent cookie, when you turn your computer off or it expires (typically) between 30 and 90 days Cookies may be used by Salesgenerator to provide you with a full range of products / services on offer Persistent cookies may be used to identify the sites business listings you visit on the Salesgenerator network and to personalize the advertising that you see when you make further visits to that site or other sites associated with the Salesgenerator network. Salesgenerator or Hume Marketing Pty Ltd ACN 142 690 631 or any associated company or associated entity or person will not be liable for any damages or claims directly or indirectly connected with actions or lack of action claimed to be caused by these parties including damages said to have been caused to third parties.